Proxima b: Is There Alien Life Just 'Down the Block,' or Even Closer? Artist's illustration of the surface of Proxima b, a potentially Earth-like world that circles the nearest star to the sun. Leroy Chiao served as a NASA astronaut from 1990-2005. During his 15-year career, he flew four missions into space, three times on space shuttles and once as the co-pilot of a Russian Soyuz spacecraft to the International Space Station. On that flight, he served as the commander of Expedition 10, a 6.5-month mission. Chiao has performed six spacewalks, in both U.S. and Russian spacesuits, and has logged nearly 230 days in space. You can read more of Chiao's Expert Voices Op-Eds and film reviews on his Space.com landing page. Chiao contributed this article to Space.com's Expert Voices: Op-Ed & Insights. The possibility of alien life has fascinated humans since our own awareness that such a thing could exist. And with the recent discovery of a possible Earth-like planet around a star in our cosmic backyard, tantalizing new questions are being raised about the possibility of finding life elsewhere in the universe. NASA's Kepler mission has thus far found thousands of exoplanets, of which approximately 40 are believed to be in or near the "Goldilocks Zone" — a just-right spot in orbit around a star where it's neither too hot nor too cold to support life as we know it. Now, scientists have found such a planet orbiting a star down our own cosmic "block" — a possible rocky planet around Proxima Centauri, our closest star. They have christened it Proxima b. In August 2016, astronomers announced that a potentially Earth-like planet orbits Proxima Centauri, the closest star to the sun. Learn about the exciting discovery in this infographic.See our full infographic here. But there are big differences, too. The planet's orbital period is only 11 days, and it does not rotate on its axis (meaning the same side always faces the star). Also, the radiation environment is estimated to be much harsher than that for Earth. Still, scientists say some kind of life could exist there. I have had the privilege of flying to space, and I have gazed down at our home planet, marveled at the moon and peered out at the universe beyond. I've had time to consider this question from that vantage point, and I've experienced what is sometimes called the "Overview Effect." My view on alien life may be surprising to most. It certainly doesn't endear me to some religious organizations, but so what? There is still hope for me. Even Galileo was pardoned after about 300 years, for daring to say publicly that the Earth orbits the sun, not vice versa. I believe that there is life all over our universe, since it would be the height of arrogance to think that we are alone. Moreover, I believe that at some point, life on Earth will die out, either from natural causes, or from our own doing. To me, this is a natural progression, just like individual lives on our planet. Unlike many people, including several of my astronaut colleagues, I don't think that technology will save us. Indeed, there are strong arguments that after enabling life to thrive, technology is now hastening our collective demise. But that discussion is for another time. I believe that life is always starting in some parts of the universe at the same time that it is dying out in others. We don't know about each other, simply because the distances are so vast. To send a spacecraft even just to our next-door neighbor Proxima Centauri, using our current technology, would take almost 80,000 years. So, we won't easily find evidence of alien life around another star, especially those that are hundreds of millions of light-years away, or more. In this century, it is much more likely that we could find evidence of at least past, or even current, microbial life under the surface of Mars. Mars was a very different place hundreds of millions of years ago. It had a thick atmosphere with a magnetosphere to protect it and potential life from the sun's radiation. The temperature was much warmer, and there is strong evidence that past liquid water flowed on the Martian surface.Scientists recently observed evidence of salty streaks of liquid water, one of the requirements for life as we know it, flowing down slopes on the Martian surface during warm weather. For me, the discovery of incontrovertible evidence of past or present life on Mars would prove my theory on alien life, without having to send probes to other star systems. The discovery of Proxima b raises renewed interest in this question. My hope is that we will find answers in my lifetime, by continuing to look even closer than "down the block." Let's continue to explore Mars, which is in our own "backyard!" 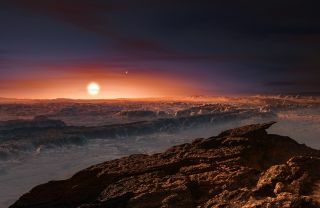 Editor's Note: This article has been updated to reflect that Proxima Centauri is a red dwarf, which is a small, cool type of star with an extremely long lifetime. Follow all of the Expert Voices issues and debates — and become part of the discussion — on Facebook, Twitter and Google+. The views expressed are those of the author and do not necessarily reflect the views of the publisher. Follow us @Spacedotcom, Facebook and Google+. Original article on Space.com.